VALDOSTA — Nearly 650 works of art — more than four times that received a year ago — were submitted for the Valdosta State University Fine Arts Gallery’s Valdosta National 2015, an all-media juried competition. From graphite and colored pencil drawings to ceramics and mixed media sculpture to oil and acrylic paintings, printmaking, silver gelatin prints, video, collage, and digital photography, the submissions came from adult artists living and working as far away as Seattle, Wash., and as close as the university’s own backyard. 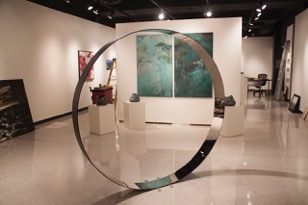 Julie A. Bowland, Fine Arts Gallery director and VSU Department of Art professor, said that the increased number of entries was the result of an appeal to a broader spectrum of artists via CallForEntry.org, an online artist exhibition site. For the exhibition, which opens at 7 p.m. on Tuesday, Jan. 20, with a reception and an awards ceremony, Susan Welsh, Valdosta National 2015 judge, selected 55 works by 35 artists from 19 states to be featured and to compete for $1,500 in awards. The exhibition will continue through Friday, Feb. 6, and is open to the general public. Valdosta National 2015, Bowland said, features a number of works with a scientific or mathematical influence, which may be due to the adjudicator’s work as executive director of the Museum of Arts and Sciences in Macon, a position she has held since 2012. 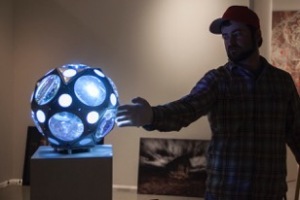 “It’s a really strong show with impressive, large-scale work,” Bowland noted. The “annual national juried exhibition showcases a multitude of media, styles, and sensibilities from across the nation. It is a wonderful indication of the diversity of contemporary art …,” she added. A painter, Welsh studied studio art and art history at the University of Georgia and Wesleyan College; her work has appeared in exhibitions throughout the region. She taught elementary school fine arts through private instruction and programs offered by the Bibb County Public School System, the Museum of Arts and Sciences, and Mid Summer Macon. She served as the artist-in-residence at Sonny Carter Elementary in Macon and designed and installed a series of educational public murals in a number of elementary schools throughout Macon. Two of those murals have been nationally recognized. Prior to taking the position at the museum, she served as vice president of Institutional Advancement at Wesleyan College. The VSU Fine Arts Gallery is located on the first floor of the Fine Arts Building, at the intersection of Brookwood Drive and Oak Street. It is open from 8 a.m. to 5:30 p.m. Monday through Thursday and from 8 a.m. to 3 p.m. on Fridays. Admission is free of charge.